Demystify Your Medicine: March, the Poplar awakes. A poplar bug gives way to fresh spring leaves! Do you smell that? A sweetness in the air you can't quite place? That is the smell of springs promise wafting off of poplars freshly emerging buds covered in sticky healing resins! No matter if you call her poplar, cotton wood or even aspen odds are good you have a variety of this amazing lady growing around you considering there are 35+ varieties of her in existence and that number doesn't even include the hybrid varieties! Now naturally she's native to just about every northern hemisphere country but even if you don't live in the northern hemisphere don't fret to much as she is a poplar ornamental tree as well as a wind/erosion break in many agricultural areas so you're likely to find her in the southern hemisphere too! But why do we want to emerge from our winter caves into the still cold and damp weather to search out these sticky buds? Because these little buds are packed with serious yet gentle healing! One neat thing you may not know is that poplars of all variety are in the Willow family! Why is that worth noting? Because this means she is packed with salicin and glycoside! What's so great about that? When our bodies come in contact with those aspects of her it get's converted into salicylic acid which is fancy talk for aspirin! Yes aspirin! Now most will claim this only occurs with internal use but that's just them forgetting that what we rub onto our skin is absorbed into our bodies which is internal use. In fact this amazing interaction is why an infused oil makes her amazing for sore aching bodies with her powerful anti-inflammatory abilities! I have seen folks who can barely move from crippling arthritis regain a decent amount of mobility with consistent use of her as an infused oil! Contrary to popular belief all true varieties of poplar have very similar medicinal properties and are generally interchangeable externally. Versus the belief that only Balsam poplar can be used. Note: Tulip poplars are not actually a poplar tree. What else can she help us with beyond sore bones and muscles? She is also an amazing antiseptic/antibacterial from her caffeates content, which is a substance that in layman's terms kills all gram positive bacteria on contact! So she's ideal for wounds, infections and even bacterial related acne! About a week ago in the middle of the night my husband burnt the inside of his arm pretty severely on our pellet stove (pretty much a wood stove), i'm talking a good 30% of his inner arm stuck to the scalding hot surface and a lot of skin was left behind on the stove! After we pulled the heat out of the burn to stop the skin cells from dying any further we began apply poplar "butter"(whipped salve) and in less than a week of daily applications it's 90% healed and it does't look like there will be much of a scar if any! I bring this up because burns are tricky and extremely prone to infection so it takes a lot for me to feel confident to handle a burn of this degree without medical attention via DRs on a man that's always getting into something dirty as he works! When her buds are tinctured she can offer us even more as she calms sore throats, internal inflammation, supports lung health as a natural expectorant, reduces fevers, thins blood (like aspirin),reducing muscle aches, menstrual cramps and excessive clotting during our cycles she is even pretty good at helping to resolve gout from knocking down the uric acid levels in our bodies! But you can also use her dried buds as an herbal infusion for oral and tonsil health! While i'd not use her as daily regime but let's say i was battling for example an abscessed tooth or something like laryngitis this would be an ideal time to use her in this way! What else can we do with an infusion? Well she's got some drying actions and helps shrink up blood vessels which means she's great for hemorrhoids when used as a sitz bath! Where can we find these amazing allies? This lady lives for the water! Which is no surprise considering she's in the willow family! This means the best place to go looking for her in her natural environment is along river banks, near lakes, ponds, springs and marsh land! You truly can find her in the early spring by following a sweet smell in the air. While the resinous buds really are that fragrant the main reason our mouths will water from her scent is because most everything else is still asleep under the snow! It's a lot like how the snow makes things factually quieter, well the cold also suppresses weak scents too. 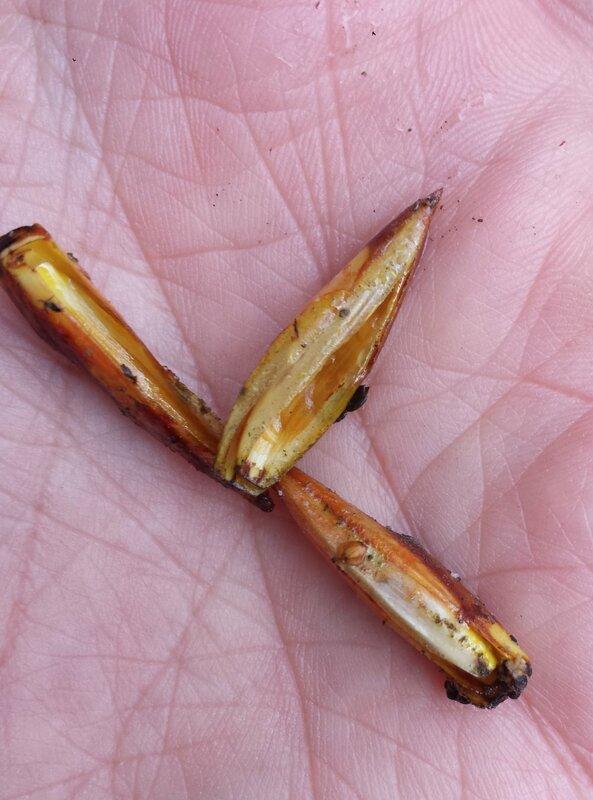 So the odds are good if you're walking along the river banks this spring you'll catch a wift of poplar buds in the breeze! What about areas that are not next to water? Can we find her there? We sure can! As I mentioned earlier she's very popular in landscaping and for agricultural reasons! Where can we go looking? Parks and walkways are a great place to start, while I normally don't advise gathering from these types of places and be sure to look into the legality of it the truth is the trees are above the level of dogs ability to piss on and no pesticides will likely be sprayed upon the tree itself. Of course if you can find a cleaner area that would be ideal! The next place you will likely find her is in-between new housing developments especially with the new hybrid varieties that grow incredibly fast! They use these as wind breaks and sound breaks! The one great thing about the hybrid varieties in this instance is that their fast growth makes their wood pretty weak so wind fallen branches are very common! So if you scout out a few areas and gasp at the height of the branches be mindful to head that way when the soon to come spring wind storms come along because you'll likely find a bounty of wind blown buds! When is she ready to offer us healing? While it's easy to become eager and start harvesting buds in February as soon as they appear, generally it will we a solid month after their appearance before the buds begin to swell with healing resins. Maybe you live in a climate where it's winter more than any other season and the buds won't appear until March, if that's the case patiently watch them until they begin to really swell up about 3-4 weeks later! The best way to tell if they are ready is if they are still closed like in the photo above and when you touch them or very gently squeeze them between two fingers they will be so incredibly sticky that you may now be wondering how in the hell to get this sticky off of your fingers! The answer to that is olive oil folks. That's what will take away the sticky! The most important thing to talk about here is harvesting respectfully, keep in mind that every bud removed from a tree is one less leaf that will unfold! With this in mind it's crucial to only gather a small amount from each tree we come across, this is also why finding fallen branches and downed trees is a blessing because at this point we can gather to our hearts content! They are soooo sticky! Yes you can go all rugged and get your hands covered in an overwhelming amount of poplar resin but realistically a pair of gloves is going to make things go a lot smoother! But maybe you have a real dislike for gloves!? The next best thing is to use a pair of sharp pruning scissors and trim each bud directly into your basket or bag. Personally I use gloves and scissors and at the end I still have to use olive oil to get resin off of my hands, face, and out of my hair! 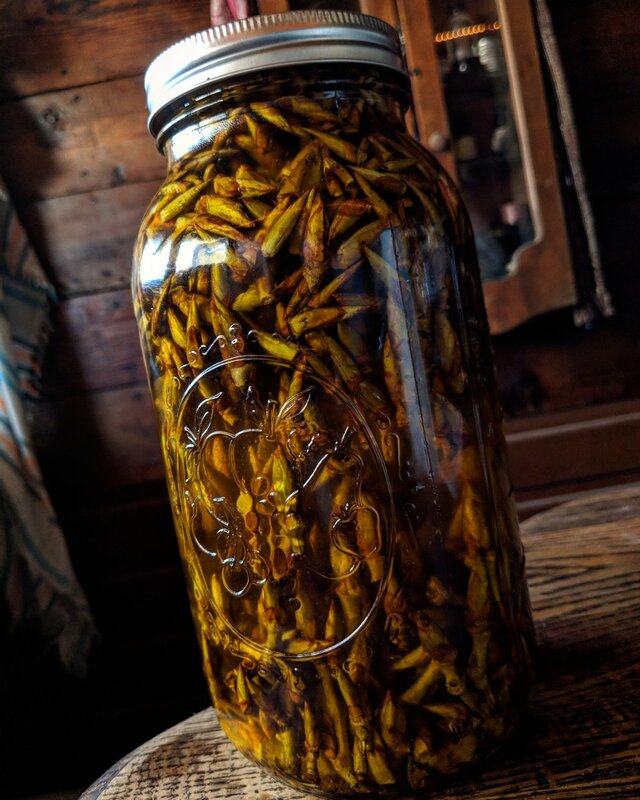 Poplar buds infusing in rich Avocado oil. Our baskets are full! Now what? Once you have gathered your buds lay them out on cardboard or something similar for 24-48 hours to allow a bit of moisture to evaporate off. Pick a glass jar that you can fill up to the top with your buds. Pour oil of choice over top all the way up to the top. Air left in the jar can lead to oxidation and spoilage. Tip: Olive oil especially extra virgin has a tendency to go rancid. I deeply prefer Avocado oil or Safflower oil. Place jar in cool dark place on top of a towel or plate to catch oil that will "weep" out of the jar. Allow to set for 6 weeks max making sure to check weekly for spoilage. You can now strain and use as a body oil or turn into a salve! Wana make a super potent oil? If you have more fresh buds on hand begin the process all over again but instead of using new oil use the oil you just got done infusing! While making a tincture is very easy please be positive of your identification of the poplar species your are working with. Place your fresh poplar buds in a jar you can fill to the top with buds. Pour 100 proof vodka (50% alcohol by volume) over top all the way to the rim. Place in cool dark place for 6-8 weeks or longer. Don't stress if you forget about it and years go by. It wont go bad. It wont become to strong. Once ready strain and use as needed for your own personal situation! Caution: Individuals who are allergic to aspirin should proceed with caution when considering internal use. Not suitable for young children. Poplar trees of the pacific northwest! Identifying poplar trees by leaf shape! Remember you are smart enough to do this! Join the free message board! Copyright © 2019 She is of the woods wild wood apothecary LLC All rights reserved.